This 11" long narrow V neck dress has a shirt collar and lapels and is by Pamela Barish. Below the V neck and above the waist are three large hidden snaps. 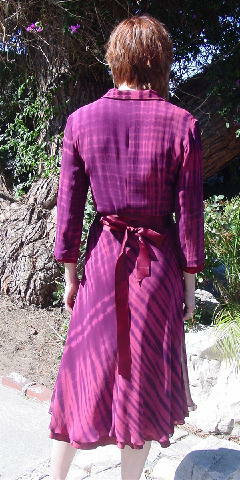 It has a 126" long by 1 1/2" wide burgundy ribbon tie belt and color matching thread belt loops. There is an 11 3/4" long left side upper zipper. The (synthetic) dress fabric is somewhat see-through and it has a light red background with a freeform dark red wine-burgundy line design pattern. 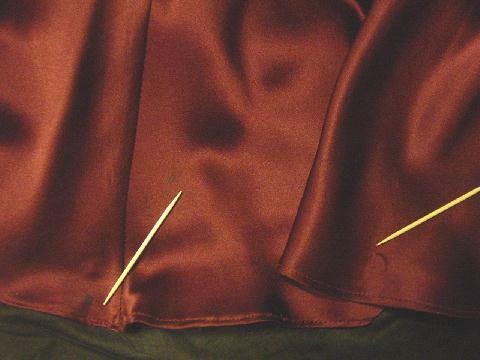 There is a full shiny synthetic lining in a deep burgundy color which extends approximately 1" below the dress sleeve ends. It has a full flirty skirt and the sheer outer skirt area flows freely from the waist down from the burgundy lining, which also extends below the dress fabric hem. The tag says size 6, but it fits more like a size 4/6. The bottom left side of the lining has a line snag mark which is difficult to see when the dress is worn, because of the full skirt area. The lining also has 2 dark spots; one is 3 1/4" upward from the bottom, left of the center, and the other is 3/4" to the right of center and 3/8" upward from the lining hem. That spot is 1/8" wide. shoulder to end of sleeve 18 3/4"
bottom hem side to side 54"
shoulder to hem 46 1/2"